Whether you’re gearing up for a day of skiing in Stratton or plan to do some sightseeing, starting off your day with an awesome Vermont breakfast at one of the many eateries is the first order of business . Check out our list of the 11 best places for breakfast in Southern Vermont for a most “eggscelent” meal. Located in the heart of the historic Peru village, J.J. Hapgood General Store & Eatery serves up dishes using Vermont meat and dairy products. While you can find your basic eggs and toast, you’ll also find special items like the organic oat pancakes. These are served with none other than Vermont syrup. Come in for breakfast from 7a.m.-11a.m. daily. If you’re looking for a quant place with a country setting, then you should stop at Up for Breakfast in Manchester center. Omelets, French toast, waffles, you name it and it’s served here. If you just can’t decide what to choose, try the Hungry Hiker. This dish comes with eggs, bacon, sausage, pancakes, toast, and home fries. Up for Breakfast opens daily at 7a.m. The Little Rooster Café in Manchester Center prides itself in using local products. Come in and enjoy breakfast with a European flair. The Little Rooster opens for breakfast at 7a.m. every day except Wednesday when it is closed. Located in Arlington, Chauncey’s Family Dining has been a favorite breakfast spot for 20 years. Serving up griddle cakes and Texas French Toast, you’ll get plenty of food here to start your day. Chauncey’s is open 7 days a week for breakfast. Locals and visitors love The Porch Too in Brattleboro for its specialty item, the Porch egg & cheese sandwich. This is 2 eggs, caramelized onions, bacon and cheddar cheese on whole wheat bread. Enjoy other specials like The Porch Burrito. Come in daily for breakfast Monday-Friday starting at 7a.m. Located in downtown Jamaica, start your day with one of the specialty breakfast sandwiches at the Workhorse Cafe. Choose from the “The Veggie Monstaa” or the “Vermonters Delight”. Each brings its own local flavor. The Workhouse Café is open for breakfast daily at 7a.m. Betsey Dots of Dover is a family-run restaurant located in West Dover. Serving the community for since 1991, the famous mixed berry pancakes are a favorite. You can also get staples like omelets, muffins, and eggs benedict. Betsey’s opens for breakfast at 6a.m. daily. For folks who are looking for vegan and gluten-free breakfast options, look no further than The Brown Cow Café. Local products are used to create dishes like the avocado toast and the breakfast burrito. Don’t worry about missing breakfast here because it’s served all day. Check out The Brown Cow Café in Bennington Monday-Friday from 8a.m.-3p.m. and Saturday from 9a.m.-2p.m. 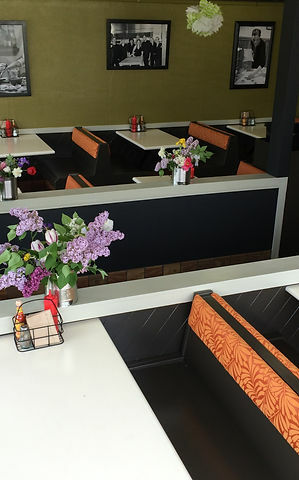 Simple, down home food is what you’ll find at Papa Pete’s, your neighborhood eatery in Woodford. Come in for jumbo pancakes and Papa Pete’s eggs benedict. The best part is that breakfast is served all day long. Papa Pete’s opens at 7a.m. daily except for Wednesday when it is closed. If you’re looking for a place for a quick breakfast and possibly something to take on the road if you’re heading to Stratton for skiing, stop by the Spiral Press Café. Located in Manchester, enjoy house-made baked goods like muffins, croissants and bagels. You can also create your own breakfast panini from a list of selected ingredients. Sit back and chill out with your favorite cup of coffee too. The Sprial Press Café is open Monday-Saturday at 7:30a.m. and Sunday at 8:30a.m. Don’t settle for just any diner in Southern Vermont. Stop by The Flamingo Diner. The Flamingo Diner in Brattleboro uses farm fresh eggs to whip up a variety of specials like its Veggie Eggs Benedict and its Green Goddess Burrito. Breakfast is served all day here except for Wednesday when the diner is closed. Set your itinerary and store these popular breakfast spots in your phone. Bring your appetite to Southern Vermont for some great breakfast dishes. Remember, mom always said breakfast was the most important meal of the day.